Lightly toast the BARLEYmaxTM flakes in a dry hot pan, taking care not to burn. Allow to cool slightly. 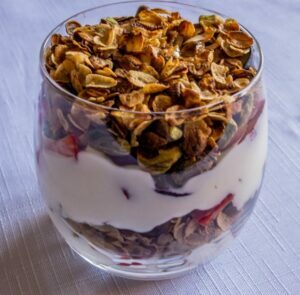 In a wide glass or single serve ceramic container, place 1/3 of the flakes, followed by half the yoghurt, nuts and berries. Repeat with 1/3 of the flakes followed by the remaining yoghurt, nuts and berries. Finish with the remaining flakes and drizzle the honey on top.